Server Technology’s PRO2 Switched PDU provides users an uptime solution within a data center equipment cabinet. The PRO2 has a flexible firmware platform that can expand upon and meet future needs of customers. It has a new faster hardware platform with additional memory and offers a complete solution for uptime and availability including features like a hot swappable network card that can be replaced under power. The PRO2 is ideal for those who will be utilizing the PDU in particularly high-density, high temperature, and high-security applications. The PRO2 is offered in single-phase 208/230V, three-phase 208V, and three-phase 400/415V in 20-30/16-32A builds of Switched and Switched POPS 30-outlet PDUs. 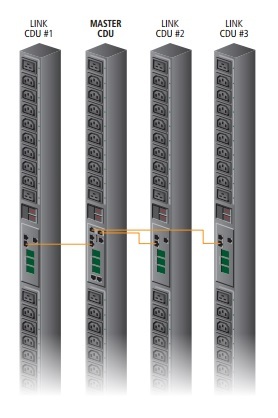 Multi-Linking of Units (1 IP for up to 4 units). Redundant Power from the Link Unit always ensuring uptime. Hot Swap network card replacement. Shallow POPS enclosure (2.25 inches deep). Graphical interface with file system, new security features and alerts. Customizable branch circuit monitoring and alerts. A little over half of the power used in the data center is used within the cabinet. Because of this, users really need to be able to monitor their devices. The PRO2 allows the user to monitor for both power and environmental usage. Inlet temperatures are getting a lot warmer as users are looking to increase efficiency within the data center. As a result of this, outlet temperatures where the PRO2 unit is installed continue to increase. Higher temperatures and increased density test performance has become vital for users and the PRO2 has been rated at a higher temp so it could meet these users’ needs. The PRO2 allows for secure firmware uploads and runs validity checks of the firmware during the upload. It also allows customers to use their own certificates and keys. Because cabinets vary in size, the last thing a user needs is a PDU that takes up too much space. The PRO2 is very shallow and therefore won’t interfere with servers and any other devices within the cabinet. The architecture allows for future expansion and flexibility. The PRO2 makes power available from the link unit to the master unit. For example, if the master lost power, the network interface would still be available to the user and they would still have the ability to access the interface of the device. The PRO2 uses a unique master link configuration for up to four units. Just one unit has the computer, so the other link units end up being less expensive.